After testing more than 200,000 chemical compounds, UT Southwestern's Simmons Cancer Center researchers have identified 170 chemicals that are potential candidates for development into drug therapies for lung cancer. The 5-year project set out to identify new therapeutic targets for non-small cell lung cancer as well as potential drugs for these targets - a significant step forward toward personalizing cancer care. "For the large majority of compounds, we identified a predictive biomarker - a feature that allows the development of 'precision medicine,' or individualized treatment for each patient, which is a major goal of the Simmons Cancer Center," said Dr. John Minna, Director of the Hamon Center for Therapeutic Oncology Research at UT Southwestern Medical Center. Lung cancer is the most common cause of cancer deaths in the U.S. for both men and women, according to the National Cancer Institute. Non-small cell lung cancer, the type of cancer studied in this research, comprises approximately 85 percent of all lung cancers. In 2017, lung cancer caused 26 percent of all cancer deaths. Using UT Southwestern's unique lung cancer cell library that is now the world's largest, the researchers searched for compounds that would kill cancer cells but not harm normal lung cells. "We began an ambitious project with the goal of identifying 'therapeutic triads': chemicals that kill cancer cells, biomarkers that predict who would respond, and the therapeutic targets on which those active chemicals work," said Dr. Minna, Professor of Internal Medicine and Pharmacology who holds the Sarah M. and Charles E. Seay Distinguished Chair in Cancer Research and the Max L. Thomas Distinguished Chair in Molecular Pulmonary Oncology. Continuing to uncover the mechanism of action for the majority of the 170 chemicals will be a key focus of future research. Follow-up work will also include testing the chemicals on other types of cancer. Preliminary work shows some of the compounds are likely effective against certain breast and ovarian cancers as well. Results of this complex project, led by Dr. Michael White, former Professor of Cell Biology and now Vice President for Oncology Drug Development at Pfizer Inc., involved members of the Harold C. Simmons Comprehensive Cancer Center and the Departments of Cell Biology, Biochemistry, Pharmacology, and Internal Medicine, and appear in the journal Cell. Dr. Minna, along with his research partner Dr. Adi Gazdar, Professor of Pathology and with the Hamon Center for Therapeutic Oncology, have carefully developed and curated a collection of lung cancer cell lines since the 1970s that is now recognized as the world's largest - and upon which this research was based. Dr. Minna was named a "Giant of Cancer Care" in 2015 in recognition of this work developing lung cancer cell lines. What made this work unusual was that they began with the chemical compounds. "Almost all cancer research is gene-first, or target-first. We began with the potential drugs," said Dr. Michael Roth, Professor of Biochemistry and a member of the Simmons Cancer Center. Using UT Southwestern's High-Throughput Screening Core Facility, the team of scientists began by testing 200,000 chemicals against 12 lung cancer cell lines. "The initial screen gave us 15,000 chemical 'hits,' way too many to work with in detail, but with repeat testing we eventually narrowed the number down to 170. 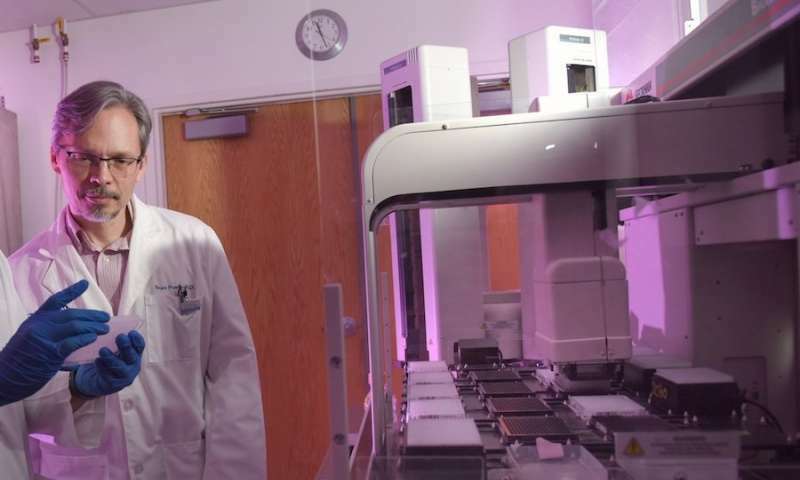 We called this the UT Southwestern 'Precision Oncology Probe Set,' or POPS," said Dr. Bruce Posner, Professor of Biochemistry and Director of the High-Throughput center. The set of 170 chemical compounds was then tested across 100 lung cancer lines. At the same time, researchers conducted in-depth molecular analyses of the lung cancer lines, including identification of genome mutations and protein expression. This information, paired with whether or not an individual cancer cell line was sensitive to a particular chemical, allowed the researchers to develop a set of biomarkers - indicators that could be used to determine if a particular cancer will respond to one of the 170 chemical compounds. The final step of the study was determining how the drugs acts on the cancer. "We scoured existing knowledge and were able to come up with the target for several examples to complete the third leg of the triad," said Dr. Roth, who holds the Diane and Hal Brierley Distinguished Chair in Biomedical Research at UT Southwestern, which is recognizing its 75th anniversary this year.